Last week I reflected our transition from Montessori to public school for Elena, two years after the decision was made. We are on the verge of making that transition again, but this time with Eli, and at a much younger age. Many of you have shared how helpful my other posts were, so I thought I would blog about this journey as well. Eli, like his big sister, has only know Montessori. 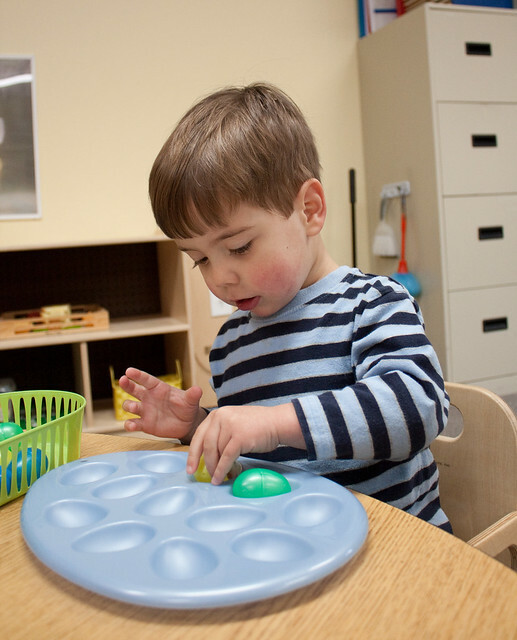 Unlike Elena, he started his Montessori experience at a younger age. Our school offers a Toddler Room, beginning at 18 months. We jumped at the opportunity not only for the convenience of dropping off both kids at one place, but to introduce Eli to Montessori from an early age. Eli started in the Toddler Room just shy of 18 months. Can I just start off by saying God bless his teachers? He still wasn’t walking(!) and he cried every time I left, but they were so loving and patient with him. By the end of the his first school year a few months later, he was walking and he adored his teachers, especially Mrs. Strantz. He’d see her coming and yell in his deep, gravelly toddler voice, “STRANTZ!!! !” He still feels the same about her, 5 years later. Eli’s birthday puts us in a sticky spot when it comes to transitions based on age. His birthday is August 3rd, always right at the cusp of grade cut-offs. He turned 3 just a couple of weeks before school started, and along with both his Toddler and Children’s House teachers, we made the decision to move him up into the 3-6 year Children’s House classroom. After 2 1/2 years in the Toddler Room, he was ready for bigger challenges. Thanks to the flexibility and child-led environment of Montessori, Eli did very well with the transition. His age and maturity level presented some challenges with self-control. His teachers were patient and consistent with him. The other beauty of the mixed age classroom is that from the very beginning Eli had the opportunity to see the bigger, older kids, which he looked up to so much, model how to be leaders and how to make good choices. So between his wonderful teachers, the examples of the older kids, and his desire to please (mostly! ), he did very well. We always knew that Eli would complete the 3-year cycle of Children’s House. Our big decisions loomed during the last year of that cycle. Would this year of Montessori be considered pre-K or kindergarten? Would we keep him Montessori? Would he enter school next year, regardless of where he attends, as a kindergartner or first grader? We decided at the beginning of the school year that he would continue to attend on the same schedule, 3 full days, for the first semester. After Christmas we’d switch to a traditional kindergarten schedule of 5 full days. So essentially we straddled the fence for the pre-K/kindergarten decision. Cost: We’ve been paying private school tuition for nearly 8 years now. While it’s not a huge burden, we’re beginning to feel that the money spent would be better invested in saving for college. Convenience: Our particular school is a 25 minute drive one-way from our home. Making the drive 3 days a week isn’t so bad, but twice a day, 5 days a week, combined with an earlier start time for elementary, is a pain. Relationships: Because our school is in a different town, we are one of the only families in our town that attends. Eli’s school friends do not live close, making playdates tricky. It also makes it hard to connect with kids his age in his own neighborhood. When Elena switched to public school, she immediately found a group of friends we never knew about, all within walking or biking distance. Learning Needs: Eli is not the same kid as Elena. Where she was advanced, he is middle of the pack. We felt that he would be sufficiently challenged in public school. He is also different behaviorly. He likes to follow the rules, and he likes being part of a big group without calling attention to himself. Our final decision was whether to enroll him as a kindergartner or as a first grader. Based on his age, he made the cut-off for kindergarten last year. By Christmas, we knew that both academically and in regards to maturity level, he was not ready for first grade. In case you haven’t noticed, we are also not a tall people! We felt like an extra year would help him to not spend the rest of his school life being both the youngest and the smallest. Not that he’ll ever tower over anyone, but still, we could cut the kid a break. Once we made those decision, we all felt at peace and felt things fall into place. Since we weren’t striving to get Eli ready for first grade, we kept on with his 3 day schedule. We both love it. He is a homebody at heart, so he loves his days “off.” And for me, preparing to send my baby on to 5 full days next fall, I’m relishing these extra days that are just the two of us. I know he won’t always long to be right by my side, chattering away, so I will take the time I have. Coming from a kid who cried every time I left him anywhere or with anyone new for the first three years of his life, this confirms what we know in our hearts. We love Montessori, but we’re ready for a new journey. I know every transition has its challenges, and I know we’ll have some difficult days ahead as we navigate a new school and new expectations with a boy is is very different from his big sister. I will continue to share our experiences along the way in hopes that it helps any other families out there facing the same decision. If you have any questions for me, ask away! And if you’ve walked this path before, please share your story and your advice for us! Love this. We too are transitioning from Montessori to public school kindergarten. Andrew will be one of the youngest, but he’s taller than most first graders now…. Same here. There will definitely be tears on that last day, as our school has been a part of our lives for 7 years and we’ve made many dear friends. But I’m also looking forward to both kids in the same school district RIDING THE BUS! We looked into Montessori, but cost/schedule just didn’t work out for us our oldest (3 1/2) is in regular daycare (with pre-school portions of the day). We’re also facing an age cutoff dilemma to some extent, but Nolan’s birthda is even later (November 4th). He’s also not big, but he’s very advanced academically and keeping him out of kindergarden another 2 years and a few months seems way too long. The school district we’re moving into will let him test into kindergarden, but the size thing is something we’re a bit concerned about. He’s got a year and a few months to grow, I suppose. The size thing most likely won’t be an issue for awhile. I look around at Elena’s classmates, and lots of the boys are on the small side compared to the girls. Hopefully our boys will get a good growth spurt in high school! There have obviously been changes to the building and the staff isn’t the same, but it thrills me that Eli and Holly will be attending the elementary school I attended. I know … how adorable will it be when they see each other in the hallway? !